Rachael Powell - The owner of Oohlalalampshades. Hello! I’m Rachael and I founded Oohlalalampshades in 2012. 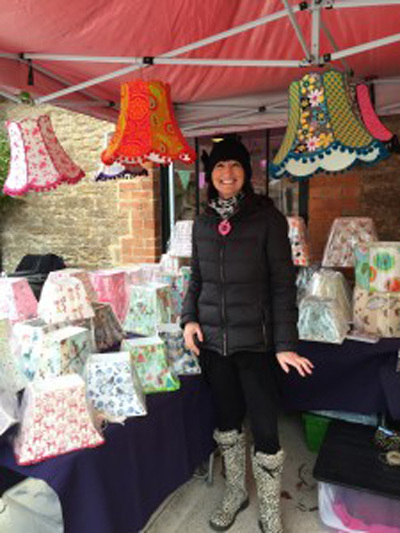 I love making lampshades! I love bold, bright and colourful patterns and mixing fabrics together for that unique look. My attention to detail is paramount and I ensure that each lampshade is finished perfectly. The Bowed Oblong style lampshades are only suitable for table lamps. These are fitted with a EU fitting and I will send an adaptor for UK fittings so they will fit any lampshade. All of the other styles are suitable for both table and ceiling. All lampshades are made with a PVC flame resistant backing. Please do get in touch if there is anything I can help you with as most things are possible! I publish my new designs on my Facebook page so if you have a minute spare you could take a peek there too. I also attend the occasional market when time allows. I hope you enjoy my website and thank you so much for looking.